Chroma launches a variety of LED lamps production line test solutions which will be presented to attendees of the 2013 Taiwan International Lighting Show. IRVINE, Calif. - March 26, 2013 - PRLog -- Accumulating years of experience in LED testing, combined with the professional automation techniques, Chroma ATE has launched a complete automated production and test solutions from upstream LED epitaxy power to terminal lighting products. In response to the era of solid-state lighting, Chroma has launched a variety of LED lamps production line test solutions which will be presented this week to attendees of the 2013 Taiwan International Lighting Show, at booth C0510. In the past, LED lighting manufacturers have mostly employed a luxmeter for production line test equipment, but the biggest issue has been measurement error between the luxmeter and the integrating sphere. There are many inconveniences when using an integrating sphere as the 100% test equipment in a production line. The large size of the luminaries goes hand-in-hand the larger size of the integrating sphere, resulting in higher automation costs. Due to high cost of a 100% lamps test for a mass production environment, most manufactures can only implement sampling test methods, resulting in the irregular quality of LED lamps currently in the market. Chroma has used unique LED lamp optical measurement technology to develop the automated test system, model 58158-SC, which suits a wide variety of LED luminaries. In addition to saving substantial space, the system can test up to 10,000 pieces per day while maintaining the measurement performance level of an integrated sphere. Through Chroma’s unique LED lamp test technology, the product yield distribution can be identified clearly, material costs can be reduced in a timely manner, the product competitiveness can be enhanced, and material waste can be reduced. 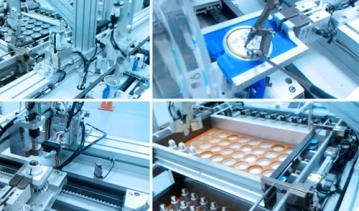 Chroma, with its automation professional experience, introduced the industry’s first LED light bulb automated assembly line in 2012, which significantly increased capacity and reduced assembly costs. It combines in line automated test program to achieve 100% testing after assembly to ensure better shipping quality of LED lamps. LED lighting has been recognized as the future trend of lighting in the global marketplace; however the lifespans of LED products are often shorter than claimed due to the uneven quality LED power drivers. Based on over 25 years of professional power test techniques, Chroma has developed the latest LED Load Simulator, model 63110A/63113A, which is able to verify the LED power driver is able to cope with the impact of changes in line power. In addition, Chroma provides the Power Meter which meets Energy Star requirements to ensure the accuracy of the input power parameter. Chroma has also enhanced its automated integration capabilities of the LED Power Automated Test System (Model 8491), which adapts not only to R&D and quality assurance applications for product integrity specifications tests, but may also be used on the production line to support testing of multiple LED drivers at one time and increase factory production efficiency. Chroma also provides a LED driver power testing guide to enhance industry expertise and testing capabilities. It will be given away during the show at Chroma’s booth C0510 or may be downloaded at Chroma’s official website, http://www.chromaate.com. The 2013 Taiwan International Lighting Show will be held during March 26-29 in the Taipei World Trade Center Exhibition Hall. Chroma representatives will be available at booth C0510 to meet with visitors to demonstrate the new LED lamp production line test solutions and answer their questions.